My two new dental crowns were completed from start to finish in less than two weeks. And I still had 99% of my time to soak up the healthy Cretan cuisine, sunshine, sea, sand and scenery. It really was a dental holiday, and I was a very happy to be a first-time dental tourist with GDA in Crete. My name is Patrick, I’m from the UK and a recent patient of Gentle Dental Abroad. As a teenager neglected going to the dentist for many years due to anxiety. I eventually overcame this, but needed quite a lot of work to restore my smile. In the following years one dentist or another said that an original crown now needs replacing. As they reached the end of life, one by one all were updated by a string of different dentists. The result was serviceable teeth, but each was a slightly different shape, size and colour from the original harmonious array. The Americans call this process “single tooth dentistry”. They also call an arch of misshapen teeth an “English mouth” That doesn’t say much for our lack of emphasis on dental aesthetics, and only focussing on function. Just a few months back I visited Gentle Dental Abroad in Crete. What a wonderful experience it had, but now I’d like to let you know how I became a dental tourist. So let’s set the clock back a few months earlier. You never know when a day will turn out badly. Her prediction was spot on. Just a couple of months later, and for no apparent reason, I felt the same tooth dislodged in my mouth. As I was it work in London, I called a city centre dentist for an emergency appointment. He re-glued with a similar warning that the stability had been compromised. He joked that if I wanted to keep it, then a diet of liquid food or soup alone would be the order of the day from now on. His bill was a little more at £100. The same thing occurred a number of times after that, always at precisely the wrong moment. Radiographs confirmed that there was indeed a fragment of the post still in the root of the tooth. None of the dentists would attempt to drill out the debris so that a new crown and longer post could be fitted. However, they did suggest extraction and a bridge to span the gap, or a very expensive implant. UK prices for these are several thousands of pounds. More worrying was the timescale from start to finish. Your front teeth are the most visible and have the greatest effect on clear speech. Given limited options I continued to periodically have the loose crown glued back on. The latest time in 2015 was in Stockholm Sweden where more of my wife’s family live. The result was a really poorly executed repair with the tooth completely out of alignment with the one beside it. It looked terrible, and cost a small fortune to fix too. My wife laughed out loud when she saw it, and joked that I should have gone to IKEA. It was now at the stage where I had to find a permanent solution. I didn’t want to add up, or continue to pay for unreliable repairs. It was time to do a little research. On our return to home, my wife and I visited a specialist implant centre here in the UK. The estimated cost would be the equivalent of a small car! I had read about dental services in various EU countries such as Hungary, and Poland, and even outside in countries such as Russia and India. Using the internet I contacted several to see how much and how long. It was obvious that “dental tourism” was the result of very expensive UK dental fees and that I was not alone in trying to save money! I received glossy brochures, follow up phone calls and many emails informing me of excellent services in Budapest and Prague. I could see they had helped many patients from the UK, Scandinavia, Germany, the Low Countries, and Ireland. All had sought better value and first class treatment. I’m not sure why medical propaganda suggests that British dentists are superior, they absolutely aren’t. I think this is an attempt to control their very lucrative market. Last year (2015) my wife and I planned to visit family who had a holiday home on the island of Crete. Closely following this, I was just about to book a separate dental trip to central Europe solely for dental treatment. Then I had an inspired thought. Out came the laptop computer and I zoomed to the Google page, typing in “dentists Crete.” Up popped three of four at the top of the results list and I sent an email to each. Naturally I added the details of our stay duration (just over two weeks) and a brief account of my problem. I knew our flight landed at Heraklion, so concentrated on this part of the island. I could see from pricelists on the pages that charges were generally even lower than Eastern Europe! Browsing around Cretan dental websites, I saw a few that were amateurish and home-made and a few others were very professional. I read the testimonials from previous customers avidly. The phrase for this is “social proof” and much like restaurant recommendations on Trip Advisor, I now take the greatest notice of these real customer reviews. It wasn’t too long before the replies from Cretan dental practices popped into my mailbox. By this time it was just a few days before our departure. The response that really caught my attention was from Eri the practice manager at Gentle Dental Abroad in Hersonissos. It came very quickly with a very positive tone, excellent English and a request for a couple of photographs. I also had a closer look at their very attractive website. My wife snapped the photos and I attached them to my next email. Hours later their lead dentist Dr George Antonopoulos wrote back to me personally saying he had studied the photos carefully and he most likely could drill out the remnant of the broken post, and fit the new crowns. The treatment could be completed within ten working days. Time was of the essence, and the schedule was ideal. I may not have told you earlier, but I decided on having both upper front incisors updated at the same time to give a balanced result. The cost of the whole plan which included x-rays, removal of the old post, fitting a new post, and two new porcelain fused to metal crowns was €640 or roughly £467. This included everything specified such as the upgraded porcelain shoulders on the crowns and “temps” until the prosthetics were ready. I had already seen an estimate from a London dentist at £700 per crown, with additional costs inflating the total cost to nearly £2000. 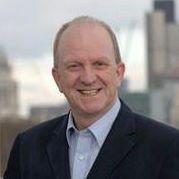 The option of an implant in the UK was around £3000. The final choice of a three tooth bridge might have been £2,500 or more. And although my thoughts were initially to take an extra trip to central after our holiday in Crete, I also saved the additional cost of more expensive flights and hotels in Hungary. So my Crete treatment cost would be about 75% less than my home cost. Who could argue with my next decision? 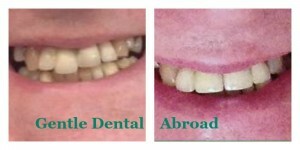 I contacted Gentle Dental Abroad and scheduled an appointment on the morning after our late night flight arrived! 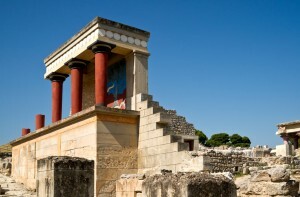 It was our very first trip with Aegean Airlines via Athens. I have to say here that they are an excellent carrier with an impeccable in-flight crew. On arrival we stayed in Heraklion at the lovely Lato Boutique Hotel overlooking historic harbour, the buffet breakfast was the best ever at any hotel. I feasted on real Greek yogurt and fresh fruit.At 9am promptly my pre-arranged taxi driver Kostas arrived in a gleaming Mercedes to take me to the clinic. We chatted all the way along the beautiful coastal route. Only pausing the conversation as he pointed out and let me take in the stunning scenery. My first real impression of Crete in the early sunshine was breath-taking. Twenty minutes later he arrived at our destination.He asked if I wanted a return trip, and I naturally said I wasn’t sure when. He said his sister lived here in Hersonissos and that he would drink coffee with her until I called. I thanked him for the ride and the business card, as I looked at the exterior of Gentle Dental Abroad. 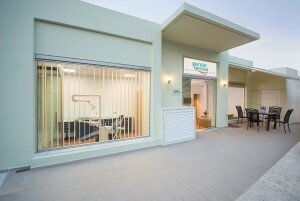 The premises of Gentle Dental Abroad were modern, well branded and even had an open seating area outside. I later discovered they were located moments away from the main street, bars, restaurants, hotels and the golden beach. Perfect! I opened the door into the reception/waiting area with about ten minutes to spare, it was decorated in a very contemporary style. I felt instantly at ease, and especially when the lead dentist who I had corresponded with, stepped over and introduced himself with a friendly handshake and a broad warm smile. 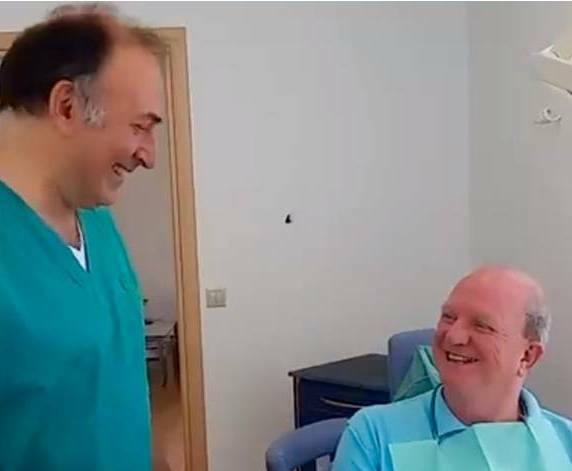 I felt instantly at ease, and especially when the lead dentist stepped over and introduced himself with a friendly handshake and a broad warm smile. I told him about my excellent ride over and highly courteous driver. He proudly told me that all of the Cretans are hospitable, friendly, honest, and loved seeing visitors fall in love with their island. He explained that he, his wife and family had moved from the Athens for those precise reasons. I answered the usual questions about my previous dental and medical history, and he said we would start with an x-ray. So into the sparkling treatment room we went. When they were developed he scrutinised them and said I can see the post segment and with a little effort I will remove it. I found out that Dr. George is a big music fan and we chatted about favourite songs and performers. First impressions count, and I really liked his manner that combined humour, warmth and professionalism. He revealed that he had first become a specialist in dental prosthetics, then taken a further DDS degree to qualify as a dentist. His English was perfect, and of course this made me realise that I didn’t speak a word of Greek. He was right and I gave the go ahead. I was so relaxed that I almost drifted off to sleep in the dental chair. He continued with the methodical unhurried preparation of both teeth ready for the fresh new crowns. This involved a little work to re-profile the above-gum stumps of my now naked natural teeth, fitting a brand new post and taking impressions. Just then a new face appeared in the room. “This is my dental technician” said George. They both asked me questions about my desired outcome and shape, size and colour of my new crowns. Then worked at length to decide on every detail. At my UK dentist the impressions are dispatched only with written notes. How great it was to meet the technician face to face and be absolutely clear about the details. George informed me that there would be a fitting of the “carriers” in a few days. These are the metal cores of the crowns, before the porcelain is added. I can’t ever remember having this intermediate stage in the UK. He assured me that precision and adjustment at this stage meant a perfect outcome. This was another indication of high attention to detail at GDS. Saving money did not mean cutting corners. Unlike dental appointments back home I felt that I was not on a production line at a factory. I was the star of the show and George checked and rechecked every detail. There was no rush or pressure to be in and out so that the next patient could jump in the chair. Soon I was sitting in the taxi heading for Heraklion with driver Kostas. He didn’t take any payment on the way over, and on our arrival at the hotel asked for exactly twice the single fare. I tried to give him an extra tip, and he protested “Thank you, is enough!” His fare was 5 Euros less than the hotel said I would pay for the complete journey. I met my lovely wife in the bar. “How’d you get on?” She asked enthusiastically. “I can’t fault anything at all. The treatment from Dr George was first class and 5 star. What a great guy, he was so careful” I said. My lovely wife asked: “How’d you get on?” “I can’t fault anything at all. That night my wife and I ate in the rooftop restaurant of the Lato Hotel. We enjoyed a superb meal looking out over the sea and before bed, took a walk in the night air of old Heraklion. Next day we took the road out of town in our little hire car and headed towards our relative’s place near the seaside town of Rethymno. The road clung to the coast and every corner produced loud wows from us as we caught views of idyllic scenery. Miles of blue water, rugged rocks, golden sand and everything drenched in sunshine. Our eyes feasted on the detail, and we loved every inch of the journey. We stopped for a delicious Greek mezze lunch at a picturesque little bay aptly called Bali. The journey took us an hour in total. Our relative’s apartment was located in a complex call Pigi Paradise. It was designed by a Norwegian architect, and the owners were almost entirely from Norway. The residences on two levels forming a near circle, and there was a large swimming pool in the centre. We made it our paradise for the next few days and enjoyed the company of Odd (Ingrid’s cousin) and his wife Kari. A few short days later I was back in Hersonissos, where George greeted me with a broad smile. The truth is that we had fallen in love with the place, and had already vowed to come back in the very near future. George showed me the little metal carriers and then removed my temporary crowns. He explained that these would be adjusted to fit exactly over the stubs of my prepared front teeth. This process only took a few minutes of very careful trimming. George told me that precision would mean no gap at the margin between my gum line and the new crowns. At the very same time, his dental technician arrived. Once again they conferred about the colour, shape and size of the soon to be made additions to the metal carriers. The real art was now ready to be performed as the technician would add, shape and kiln fire the ceramic in many stages to create my new smile! Once again the process was carried out with the utmost care. There was no pain or discomfort and I received nothing less that VIP treatment. Before I could return to holiday enjoyment, George once again fitted some transitional temporary crowns. The technician had informed him about the ready date for the final crowns, and we fixed another appointment early in the second week. I was actually getting excited now, as the final stage was in sight. The weekend went very quickly in anticipation of the next visit. On Tuesday I made the spectacular journey back along the coast to Gentle Dental Abroad once again. George asked me to update him on what my wife and I had been doing. Once again I was able to tell him of our marvellous Cretan adventures. We had recently taken a drive through the breath-taking mountains to the south to a coastal town called Matala. Every inch of the journey had been packed with wows as we drove through incredible scenery to reach our destination. The appointments did not get in the way of any of our trips, relaxation periods and excursions. Now I was back in the clinic for the final try out of the finished crowns. George showed me the prosthetics sitting on a plaster mock-up of my upper arch. After removing my temporaries, he tried each one of the two in place, then two together. I could see him smiling as has made a few minute adjustments. I think he used a little removable adhesive to fix them as he handed me the mirror to have a quick look. They looked excellent, and for the first time in many years both teeth aligned properly and were the same shape and colour! George asked me if I was happy with the look, before they were permanently stuck in. He was keen to know that I was 100% happy, or the teeth could be shortened or lengthened at the lab. I couldn’t fault anything. By then, the technician had arrived for possible instruction for any revisions. As I was entirely happy, George applied the permanent cement and fitted both crowns side-by-side. Once again handing me the mirror for a final look. The new teeth looked great. Looking back, each appointment had been easy and I was so impressed with the way that Gentle Dental Abroad had solved my problems. George is a master of putting people at ease and perfect dentistry. He really cares about your comfort and of course giving you a beautiful aesthetic result. 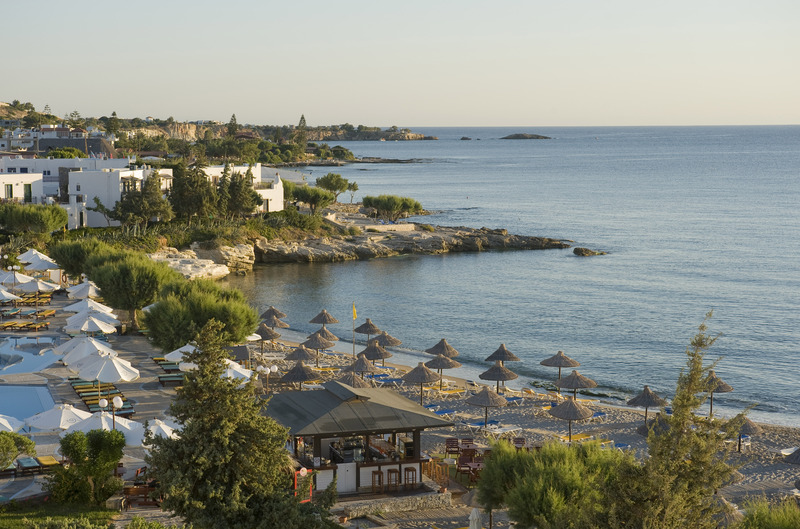 As it was now quite late in the day, I made a decision to stay overnight in Hersonissos. Eri said she would arrange a close-by hotel. She made a quick call and informed me that my hotel was just across the road, overlooking the beach, and would cost the very reasonable fee of 20 Euros! Eri then acted as my guide and walked me to the hotel. Once again I was astonished by the quality, location, and value of the room. 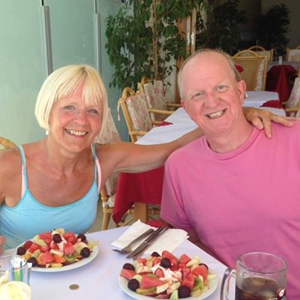 My experience with Gentle Dental Abroad had been first class at every step of the way. My final bill was about 25% of my typical home estimates, and treatment quality was far in excess of even private treatment in the UK. You really get personal, dedicated service. Like anyone considering dentistry away from home, I was a little concerned about whether lower cost would mean sacrificing quality. In answer to that I will say that I have now made further plans to return for more revisions to old and failing dental work on my lower arch. On seeing my excellent new smile, my wife has also scheduled to have Dr George update one of her upper crowns. We will both return in May 2016. I give Gentle Dental Abroad the highest recommendation at all levels, and I’m not surprised they recently won a What Clinic Award for 5 Star Customer Service. This year I am returning for a continuation of my treatment. I will create a small diary of my dental treatment and vacation and share it with you. You can get a glimpse of my dental makeover and how it fits with my vacation by following Gentle Dental Abroad facebook page or subscribing to the newsletter.